Over the past month I’ve had the opportunity to try out a Galaxy Samsung S4 on Walmart’s Family Mobile wireless unlimited plans. At $40 per month with unlimited data and voice, I was intrigued by the fact that this plan could compete with some of the other major providers, and offer a cheap wireless plan that doesn’t tie me to any contracts either. In order to compare how much I’m paying now to what Family Mobile offers at Walmart, I decided to give a brief description of what I get with my current provider to compare the two. First off, when I heard about the new Samsung Galaxy S4 being offered by Walmart I thought I’d check out my local store to see what options they offered. Unfortunately, my local Walmart doesn’t offer any Family Mobile devices or Family Mobile starter kits, so if you have the same problem, then you’ll need to use the Walmart.com electronic section to find the phone and SIM card you need. 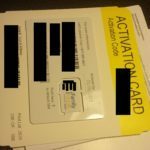 Overall, the online feature of buying a SIM card that is part of the Family Mobile Unlimited Plans is pretty straight forward and will arrive at your home in about 5-7 business days for $3.97 shipping or free in store pickup. When I tested out the Virgin Mobile service I was extremely disappointed with the coverage experience I had with them, but T-Mobile coverage has been a little different. While traveling back home to the farm, along the interstate, and out of the middle of “no where” I was able to have T-Mobile phone coverage in almost every area. This was a lot better than what I experienced while I was testing Virgin Mobile. On the downside, I didn’t always have data coverage outside of large metropolitan areas in the Midwest, and the 3G and 4G coverage was spotty. Even when I had what the phone said was 4G coverage in large metropolitan areas I found the speed to still be somewhat slow. I highly recommend reviewing the coverage in your area and common traveling areas by looking at the T-Mobile coverage map. Here is the link that I used to find out what areas are covered in my area that will help you too. In reviewing the Samsung Galaxy S4, I have to say I was EXTREMELY pleased with the phone. Having been a previous Apple iPhone and iPod user it took a little getting use too, but after about a week of using the phone everything seemed a lot easier and friendly to navigate. While navigating through the Play Store (application store) I found it extremely easy to download and use common application like Skype (chatting with my aunt online), Twitter, Snapchat, Strava (for tracking my friends’ running and biking stats), and general e-mail features. Mobile Hotspot – I loved the possibility of sharing out my internet connection and service to family and friends! This is an extremely nice features to have and easy to use with the Samsung Galaxy S4. Typically with other phones, you have to go through 100 steps in order to turn your phone in a mobile hotspot, but not with this phone. As always using your phone as a mobile hotspot is another great option to save your family money and could allow you to disconnect your home internet connection. Again this all depends on your 3 or 4G coverage in your area, but can help ya save a few dollars at home. Voice to text – the Samsung Galaxy S4 has the best voice to text feature I’ve ever tested on either Android or iPhone. Even better is the feature is built-in and doesn’t require any apps to be installed. The voice to text feature is extremely helpful for “writing” long e-mails or texts. I was so impressed by the voice to text feature that I even wrote an entire blog post by speaking to my phone. Cloud features and integration with my Google account – the ability to link my Google account and setup syncing with all my online pictures, contacts, Google maps, and Google docs was awesome! Unlike the iPhone, the Samsung S4 easily pulls all this information together for me to stay in contact with family and friends and I have all of my online data available to me. It makes it nice to be able to auto backup my data to either my Samsung account, Google, or with Dropbox. Settings and Advanced Features – if you buy the Samsung Galaxy S4, then I highly recommend checking out the advanced features. To access these features you need to use the pull down menu at the top of the phone, and click on the settings (appears as a gear) menu at the top right. In this menu you have access to “Connections”, “My Device”, “Accounts”, and “More”. Under the connections menu I really liked the ability to track data usage and setup notifications when certain limits. Also this feature allows you the ability to track which apps are using the most bandwidth too, which is a “nice to have”. Lastly, I really liked the new features of the “Air View” (ability to control your screen with the wave of your hand), and the ability to share files over S Beam and NFC. Pretty neat features that some people may not know about or use, but is a great option for sharing files with family and friends. One other point I wanted to point out to our readers is to make sure you order the Micro SD card when you purchase the Galaxy Samsung S4. In purchasing my online T-Mobile Starter Kit I made the mistake of ordering the regular sized SD card. Do not attempt to shove the regular SD card in your S4 or you’ll destroy the phone!!! It’s extremely important to make sure you get the micro version whether you buy it online or in the store. Don’t make the same mistake I did. Attached to the right is a picture of the regular SD card, which isn’t the one you want for the Galaxy S4! Overall, after reviewing the phone for a month, I’ve been extremely pleased with the Samsung Galaxy S4 and Family Mobile plan. The plan and phone offers my family another option to save money (about $25/month over 2 years), and the S4 offers a lot of features that not only compete with the iPhone, but supersede it! I’ll be reviewing the phone for another 30 days, so I’d love to hear from other readers, if you’ve tried out the Galaxy S4 or ever used Family Mobile phone service? Let me know your thoughts on either. I’ve had Walmart family mobile for several years now. It is terrible service. Dropped calls, no service, even dropped a 911 call several weeks ago. Now I,ve heard they sold the T Mobile service to Trac Fone. Now my service is even worse. I even thought it was my phone and upgrade. It didn’t make a difference. Still lousy service. Unlimited data and talk/text doesn’t mean a thing if you cant use it. I’d agree! The service definitely got worse. That is why I switched to Republic Wireless, which is only $5/month or $30/month for the 2GB plan. Check out my posts on Republic Wireless! Kudos to Walmart Family Mobile!! This has been the best service I have had through a wireless provider thus far. 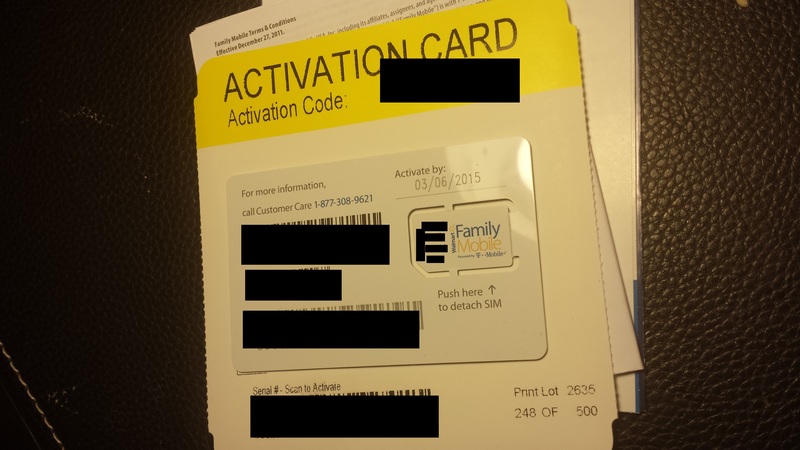 I have been a customer of Walmart Family Mobile for almost 2 years now and I would not think of switching providers for anything. My bill never has any suprises and the monthly service is so affordable!! My browser is dependable and I do not experience crashes or freezes when I surf the internet as I did with other providers in the past.. I recommend this service to everyone. I am extremely pleased. @Ruser – no I haven’t received my first bill yet, but I’ll be sure to provide feedback afterwards. @Clay – I’d never heard of consumer cellular before. Maybe I’ll have to write a review on it. @Martha – I’m not sure on that. I don’t know how other cell providers take to moving a phone purchased online to consumer cellular. I’d encourage ya to reach out to consumer cellular. Sorry I couldn’t be more help. I have been very happy with Consumer Cellular so am now searching for a site to purchase Galaxy II, III, or IV at discount so I can stay with them and still have the phone I want. Any suggestions beyond eBay? Thanks. I’ve been told by many that T-Mobile’s coverage is poor, so good you included a coverage map. My family went with Consumer Report’s highest rated cell phone service for years: Consumer Cellular (sold online and at Sears). Not only NO CONTRACTS, but you are on AT&T wireless network. And AARP members get discounts. Consumer Cellular is fantastic! 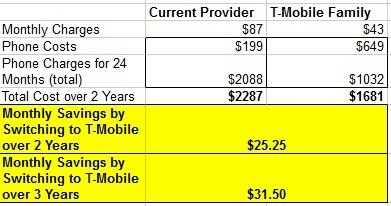 My wife and I have been with T-Mobile for two years, and we’re considering switching once our contract is up in September. Their new monthly plans are nice, but the cheapest option is actually slightly more expensive than what we pay now for our contract plan. It looks like these Walmart Family Plans will be considerably cheaper, and I imagine we can use our current phones, too (although the tech-guy in me would love to upgrade to the Galaxy S3!). Have you seen a bill yet? Are there any taxes or extra charges we should be aware of? Thanks for the post! I’ll have to discuss this with my wife. I just wanted to point out that it’s actually called a nano simcard, not a micro sd card that these phones use for service, of course they do use a micro sd card for additional flash memory storage. @Kasey – no you don’t need to pay extra for the hotspot. Thanks everyone for the great comments! Also feel free to ask questions too! Great and candid review Charlie. We are looking into a text and talk plan for our oldest child, and the Walmart plan just may be the way to go for us. I agree with Andy! You get a far better deal from HSN. $109.00 for Smartphone with 1400 minutes. Minutes tripled for life when added. Chargers included too. Thanks for breaking this down as I have been looking into this for my wife and I. I appreciate your honesty and gradings! Nice work here, but the idea of giving Walmart and the crooked Walton family any of my hard earned money is enough for me to pay more elsewhere. You don’t have to pay extra for using mobile hotspot? Thanks for this review–been thinking of doing the same for a while now.